Wellscroft Wednesday Workshops, a series of short, focused fencing workshops designed to give you a hands-on and personalized learning experience. Whether you are new to farming, an experienced farmer, gardener, commercial grower, or just interested in learning more about existing fencing systems, you will benefit from these informative workshops. The non-refundable fee of $10 covers registration for the workshop, informational materials, and snacks, and it can be credited towards a purchase of $100 or more the day of the workshop. Classes are limited to 15 participants! All workshops are held on Wednesday afternoons from 1:00 - 4:00 p.m. at our Harrisville, NH headquarters. Residential Gardening - Keep Critters Out! April 24, 2019, 1-4 p.m. Nothing is more infuriating than waking up one morning to find that those little seedlings you have painstakingly nurtured, anticipating a healthy, homegrown meal for your family, have been nibbled to the ground overnight by foes of the forest! 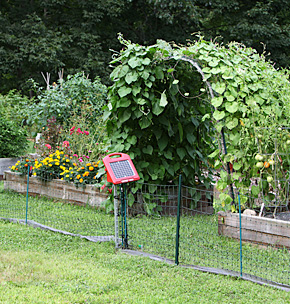 In this workshop, we’ll cover everything you need to know to select, install, and maintain an effective electric garden fence. By the end of the workshop, you’ll have the knowledge and confidence to thwart wildlife and send them running back to the woods. June 12, 2019, 1-4 p.m. If you find electric fence to be mysterious, confusing, or just plain intimidating, then this workshop is for you. In three hours, we’ll cover the basics of how electric fence works and teach you how to effectively troubleshoot, identify issues, and properly fix your fence. 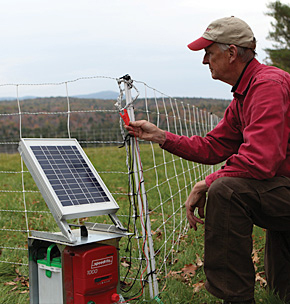 Participants will have hands-on opportunities to use tools and do repairs as well as learn tips, techniques, and best practices for maintaining electric fence throughout the year. July 17, 2019, 1-4 p.m. 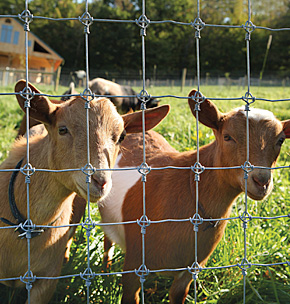 There are many options to choose from when selecting a fence for your sheep and/or goats. In this workshop, participants will learn how to choose the appropriate fence for their unique situation, as well as what to expect for maintenance down the road. We will tour existing fences on Wellscroft Farm and discuss what we’ve learned over the last 40+ years that may help shape your future fencing and livestock decisions. August 14, 2019, 1-4 p.m.
As the interest in backyard poultry continues to grow, hungry predators are finding more and more locations for “drive-thru” meals. Don’t tempt them! This workshop will cover all aspects of electric poultry netting systems including: installation, proper grounding, maintenance, baiting for predators, and how to train your fowl to keep them safe. 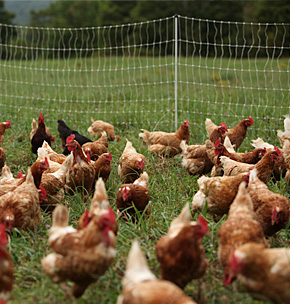 We'll also briefly discuss permanent fence types and ways to protect your poultry from aerial predators. 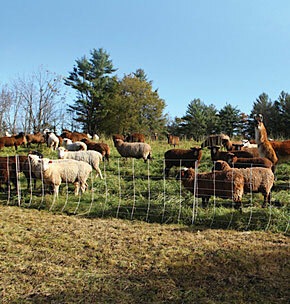 October 9, 2019, 1-4 p.m.
More and more farmers are realizing the benefits of grazing their livestock well beyond the traditional timeline by using portable electric netting. 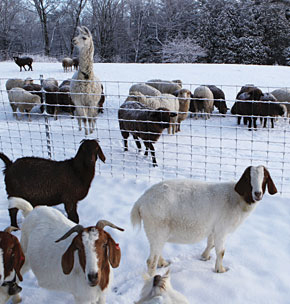 This workshop will teach the basics of electric fence and how you can use it to save on feed costs by extending the grazing season until snow falls. Participants will get hands-on experience by moving one of Wellscroft’s flocks – there’s no better way to learn than getting your boots dirty! Don’t worry - our border collies will be standing by in case things go south. November 13, 2019, 1-4 p.m. When the days begin to get shorter and colder, out comes that “winter checklist.” Readying your fence for winter is as important as monitoring it during the summer. We’ll teach participants how to properly store their electric netting and energizer, and tips for winterizing permanent fencing including switching to a pos/neg system. We’ll also cover end-of-season techniques and preparation required to dust off, prepare, and re-energize your equipment for springtime use. Wellscroft Wednesday Workshops are a series of short, topic-focused fencing workshops designed to give you a hands-on and personalized learning experience. The non-refundable fee of $10 helps cover the cost of snacks, information packets, and staff, and it can be credited towards your purchase of $100 or more the day of the workshop. All workshops are held on Wednesday afternoons from 2-5pm at our Harrisville, NH headquarters. See Product Description tab below for our schedule of upcoming workshops. Workshops are limited to 15 participants!